To Cite: Safari S, Sadegh Tabrizi J, Jafari Rouhi A, Sadeghi-Ghyassi F, Ghojazadeh M, et al. Family Members’ Attitudes Regarding Family Presence During Resuscitation of Adults: A Systematic Review and Meta Analysis, Ann Anesth Crit Care . 2016 ; 1(1):e10204. doi: 10.5812/aacc.10204. Context: Family presence during resuscitation (FPDR) is a controversial debate throughout the world. Experts believe that FPDR is a cultural and ethnical issue and that countries have different views regarding this matter. 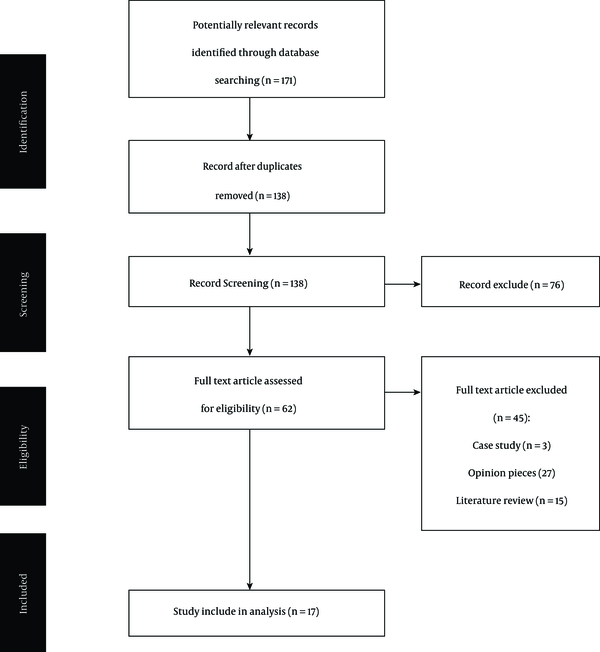 The aim of this study is a systematic review and meta-analysis of all available studies assessing patient families’ views regarding their presence during resuscitation. Evidence Acquisition: Studies reported attitudes of the patients’ relatives toward FPDR were eligible for inclusion. Case reports, letters, opinion pieces, and reviews were excluded from the study. A systematic search was conducted in Medline, Embase, CINAHL, Cochrane library, Web of Science, SCOPUS, PsycInfo, and other related databases based on selected keywords. The qualities of studies were assessed using Critical Appraisal Skills Programme (CASP) and STROBE statement. Comprehensive meta-analysis (version-2) was used for data analysis. Heterogeneity was assessed using the Cochrane Q-statistic and the I2 statistic. Publication bias was detected through funnel plot. Results: A total of 18 studies were selected, including 10 cross-sectionals and 8 control trials. The results were categorized in three items: tendency for being present, satisfaction, and coping. A meta-analysis was done for 9 descriptive cross-sectional studies. The event rate of being present was 0.73 (95% CI: 0.60 - 0.83), which was statistically significant (P = 0.001), whereas the event rate of coping was 0.62 (95% CI: 0.48 - 0.73) and was not statistically significant. Conclusions: The results of this study showed that the patients’ families tend to be present during resuscitation and believe that some rules should support FPDR. In terms of anxiety disorders and PTSD, when there were more intervals, family’s presence and their emotional supports had a positive effect on them. However, the role of the medical staff cannot be ignored in this regard. Copyright © 2017, Iranian Society of Anesthesiology and Critical Care. This is an open-access article distributed under the terms of the Creative Commons Attribution-NonCommercial 4.0 International License (http://creativecommons.org/licenses/by-nc/4.0/) which permits copy and redistribute the material just in noncommercial usages, provided the original work is properly cited. Traditionally, in the hospital, whenever a patient goes through a cardiac arrest the patient’s family is sent to the waiting room (outside the resuscitation room) at the onset of resuscitation, and generally a nurse informs the patient’s family regarding the patient’s condition. Allowing family presence during resuscitation (FPDR) is a controversial debate in the United States and has led to a widespread of debates regarding this challenging issue (1). The development of FPDR dates back to 1982 at Foote hospital in Jackson, MI when in two separate incidents the patient’s family members demanded to be present at the bedside of their patient. In the first incident, a patient’s family member got in the ambulance and refused to leave the patient during resuscitation, while in the second incident, the patient’s wife demanded to be present at the patient’s bedside only for a few minutes. However, the police officer yelled at the wife and only allowed the priest who accompanied the patient’s family members to attend the bedside (2, 3). During the Strategic Conference that was held in 2000, experts and professionals from across the globe indicated that FPDR is a cultural and ethnical issue and many countries have different views regarding this matter and their culture (2). Many local studies have been conducted on the views of physicians and nurses regarding FPDR. A study conducted on 277 physicians and emergency medicine residents in Iran (4) showed that the majority of participants (42.2%) were opposed to FPDR, however, this is not true about the patient’s family. Studies that investigated the relatives’ view regarding FPDR are fewer. The aim of this study was a systematic review and meta-analysis of all available studies assessing the views of patient families’ regarding their presence during resuscitation. Studies that reported the attitudes of patients’ relatives toward the presence of family members during resuscitation were eligible for inclusion. Studies involving pediatric patients, both adult and pediatric patients, attitudes of nurses, physicians, and health care providers, attitudes of patients, public’s attitudes, as well as the attitudes of family members who were not present during resuscitation were excluded. Case reports, letters, opinion pieces, and reviews were excluded from the study. A systematic search was conducted up until May 2015. The following databases were searched: Medline (via OvidSP), Embase, Pubmed, CINAHL, Cochrane library, Web of Science, SCOPUS, PsycInfo, Iranmedex, Magiran, and SID (scientific information database) for Persian studies. For the thesis, dissertation, as well as unpublished studies, the following databases were searched: Proquest dissertations and theses database, IRANDOC (including thesis and dissertation), clinicaltrials.gov, and Iranian registry of clinical trials (IRCT). No language and date limitation was applied. Free-text and controlled vocabulary were selected and searched according to the following keywords: family members/relatives; family presence during resuscitation/family presence during CPR/family witnessed resuscitation/family witnessed invasive procedures; resuscitation/cardiopulmonary resuscitation; family presence/family witnessed/family-centered care. Further details of search strategies are available in Appendix1. Reference lists of relevant articles were searched for other potentially relevant studies. Two independent authors (H.S., A.J.R.) conducted the data extraction and quality assessment. Each study was assessed according to the eligibility criteria. Any disagreement was resolved by consensus. The qualities of the clinical trials were assessed using the critical appraisal skills programme (CASP) randomized controlled trial checklist. For cross sectional studies, strengthening the reporting of observational studies in epidemiology (STROBE) statement was used. Studies scoring more than 50% were included in the review. In this study, clinical trials were excluded from the statistical analysis because of insufficient data. Meta-analyses of descriptive cross sectional studies assessing the desire of being present during resuscitation and coping among patients’ relatives were conducted using CMA 2.0 (comprehensive meta-analysis version 2) software. Heterogeneity was assessed using the Cochrane Q-statistic and the I2 statistic (P < 0.05 was considered significant). The random effects model was used because of the significant heterogeneity amongst the studies. Potential publication bias was detected through funnel plot. In this study, after the initial search and based on the titles found, a total of 171 potentially relevant papers were selected, which reduced to 138 papers and a dissertation after removing duplicates. The abstracts of these papers were carefully studied and about 76 papers were excluded, as they did not meet the inclusion criteria. Finally, 62 full texts were reviewed and 16 papers as well as a dissertation were included in this study. Also, a study recently conducted by the author (unpublished), was added to the study (Figure 1). Studies were assessed for methodological quality and all articles were eligible for inclusion in the study. From a total of 18 selected studies, 10 studies were descriptive cross-sectionals and 8 studies were experimental and control trials. Table 1 shows a summary of papers investigated. Taraghi et al. (5) 2013 Cross - sectional 148 patient’s family members were evaluated by a questionnaire about their tendency to be present during resuscitation and decision-making authority for their presence. 48% responded positively, while 41% responded negatively, with 24% abstention. Also, 46% of these people believed that the physician is responsible to make decision about family’s presence during resuscitation. Mottaghi (6) 2013 Cross - sectional 144 patient’s family members were evaluated by a questionnaire about their tendency to be present during resuscitation and decision-making authority for their presence about a month after the death of their patient. 61% of family members believed that they had the right to be present during resuscitation and 56% believed that they should be asked about their tendency to be present during resuscitation. But 91% of these people believed that it was the physician’s right to determine whether or not they can be present in the resuscitation room. Leske and Brasel (7) 2010 Cross - sectional Evaluation in terms of problem solving, coping and well-being in patients ‘family members who witnessed CPR (n = 16) compared to those who did not (n = 17). No significant difference was observed between the two groups in terms of mentioned factors. Ersoy et al. (8) 2009 Cross - sectional 420 patient’s family members were evaluated about their tendency to be present during resuscitation of their patient and in terms of democratic and socio-economic status. 66% of total people surveyed tended be present during CPR that factors such as male gender, history of the previous presence during CPR and close relationship had significant effects on tendency to be present during CPR. Zakaria and Siddique (9) 2008 Cross - sectional 290 patient’s family members were evaluated by a questionnaire consisting of 4 general questions about their tendency to be present during resuscitation and their ability to make decisions on their presence or absence and the effect of their presence on the patient and themselves. 94% of people tended to be present during restoration and 98% noted that patient’s family members should be allowed to be in the resuscitation room, 52% of them believed that their presence during resuscitation of their beloved ones was helpful for the patient and the family. Mazer et al. (10) 2006 Cross - sectional 408 ordinary people were asked by telephone about their tendency to be present during CPR. 49.3% of people tended to be present during CPR of their beloved ones. Most people significantly believed that their presence during CPR was useful for the patient, but not for family members. Meyers et al. (11) 2000 Cross - sectional 39 patient’s family members were evaluated about their satisfaction of their presence during resuscitation. 98% of family members stated that their presence during resuscitation is their inalienable right and they wanted to be present in the same situation. 100% of them believed that their presence during resuscitation had a good effect on them, and 95% believed that their presence was helpful for their patient. Meyers et al. (12) 1998 Retrospective, descriptive Survey of family members (n = 25) by telephone 8 weeks to 15 months after their patient’s death. 80% of family members stated that they wanted to be present. 96% believed that their presence should be considered during resuscitation and 68% thought that their presence would help their patient and themselves. Barratt and Wallis (13) 1998 Cross - sectional Determining whether family members want to be present during resuscitation (n = 35). Most family members of patients tend to be asked to be present during resuscitation, as they do not have a proper perception of resuscitation. Doyle et al. (3) 1987 Cross - sectional 51 patient’s family members were evaluated bout their attitude to the presence during resuscitation. 94% of patient’s family members tended to be present in case of similar situations. 76% dealt with issues of death better and 64% thought that their presence during resuscitation is useful for family members of the deceased. Soleimanpour et al. (14) unpublished Randomized control trial 133 patient’s family members were divided into intervention (n = 79) and control (n = 59) groups. In the intervention group during resuscitation patient’s family members emotional and psychological supports were conducted based on a specific protocol and after three months, the family members’ psychological status was assessed in terms of PTSD, anxiety disorders and depression based on a standard questionnaire. 100% of family members tend to be present during resuscitation and depression, anxiety, and PTSD were significantly higher in the control group. Jabre et al. (15) 2014 Randomized control trial 408 people were divided in two intervention (n=198) and control (n=210) groups and after one year were evaluated in terms of PTSD, depression, anxiety, and grief disorders. PTSD, depression and grief reaction were significantly lower in the intervention group. Jabre et al. (16) 2013 Randomized Control trial 570 people were divided into intervention (n=266) and control groups (n=504) and evaluated after 90 days in terms of PTSD, depression and anxiety. PTSD was significantly higher in the control group than the intervention group and was much lower in the group who witnessed CPR. Compton et al. (17) 2011 Clinical trial 65 patient’s family members were divided into two groups: FWR (Family Witness Resuscitation) group (n=24) and non-FWR group(n=41). After 30 and 60 days, both groups were evaluated and scored in terms of PTSD and depression. No difference was observed between PTSD and depression scores between the two groups. Pasqual et al. (18) 2010 Comparative study (Clinical trial) 50 patient’s family members: present during restoration (n=25) and not present during resuscitation (n=25). Score of the group who was present during resuscitation was more than that of the control group in all three cases (anxiety, satisfaction and well-being). Compton et al. (19) 2008 Clinical trial 54 patient’s family groups who were resuscitated outside the hospital were divided into two FWR (34) and non-FWR groups (20) and a month later were evaluated in terms of PTSD symptoms. Total PTSD symptom score was nearly doubled in the FWR group as compared with non-FWR group, and even individual symptoms of PTSD (avoidance, increase arousal, re-experiencing) were more in the FWR group. Holzhauser et al. (20) 2006 Randomized control trial 99 patient’s family members were divided into two groups of those who were present in resuscitation room (n=39) and those who were not (n=60). 55% of those who were present during CPR had good feelings. 96% of them believed that their presence is helpful in patient’s outcome. Rabinson et al. (21) 1998 Clinical trial When emotional and psychological supports were provided, FPDR was evaluated a month later in terms of anxiety, depression and other symptoms. 25 patient’s family members were evaluated: control group (n=12), resuscitation group (n=13). No difference was observed between the two groups in terms of psychological symptoms and differences. In a study conducted by Meyers et al., 80% of family members’ wanted to be present during resuscitation (12). In other studies (3, 11), families also tended to be present during resuscitation of their relatives in the future. In these studies, families stated that they have the right to be present during resuscitation and acknowledged that FPDR is useful for them (family) and their patient. A study conducted in 2006 by Holzhauser et al. (20), showed that even in the control group of the study (non-CPR group) 72% of these individuals acknowledged that if they were present during resuscitation they could better cope with stress. Ersoy et al. (8) discussed the family’s tendency to be present during resuscitation and various factors affecting this tendency. He concluded that among men who wish to be present during CPR, have no history of being present during a resuscitation leading to death, and also the degree of kinship (closer) lead to a significant and clear increase in the tendency of being present during CPR. Factors such as age, level of education, and type of disease (trauma or organic disease) do not affect family’s tendency to be present during resuscitation. The study of Mazer et al. (10), conducted on 408 of family members, showed that from the people who were randomly selected and interviewed by telephone, 49.3% managed to be present during CPR of their beloved ones. A study conducted in Pakistan done on 290 patients’ family members whose patient died after resuscitation (9), showed that 94% of people tended to be present during resuscitation and 98% noted that patient’s family should be allowed to be present in the resuscitation room, however, a smaller number of the patients’ family members (52%) believed that their presence during resuscitation would help the patient and them (9). Unlike the above-mentioned study, in a study conducted in Iran through a thesis (6) done on 144 patient’s family members, it was shown that about 60% of them believed that they had the right to be present during resuscitation, where as 56% believed that they should be asked about their tendency to be present during resuscitation. However, 91% of these people believed that it was the right of physician to determine whether or not they can be present in the resuscitation room. Another study conducted in Iran by Taraghi et al. (5), had similar results. In this study, performed on 148 patient’s family members, a question was raised on their tendency to be present during resuscitation; 48% responded positively, while 41% responded negatively, with 24% abstention. Furthermore, 46% of these people believed that the physician is responsible to make decisions regarding the family’s presence during resuscitation. Several studies revealed that a large number of guardians had an appropriate perception about their patient’s critical situation as the result of their presence during resuscitation (3, 11). In a retrospective study, Barratt et al. showed that most families appreciated that they were allowed to be present during CPR (13). Another study conducted in 2000 by Meyer et al. (11), on 39 patients’ family members, indicated that the entire family in the study believed that their presence during resuscitation was effective and they were completely satisfied. Holzhauser et al. (20) showed that all those who were present during CPR operations believed that their presence was effective on their patient’s outcome. Meyers et al. (12) concluded that the families presence during resuscitation of their beloved ones led them not to have post-traumatic memories up to 2 months. Robinson et al. (21) showed that the patient’s family’s emotional and psychological supports during resuscitation did not affect the development of the family’s psychological complications. Nonetheless, the sample size in this study was small and the statistical analysis was not strong. In a study conducted by Lesk and Brasel (7) between the CPR (FWR) group and non-CPR group, it was shown that symptoms such as coping, sense of well-being, and problem solving were similar in both groups and no significant difference was observed. This study was conducted on family members of trauma patients (accident or gunshot), who naturally suffer more psychological consequences than those in medical or chronic patients, whether or not they are present during resuscitation. However, interviews in this study were conducted with people 2 days after CPR in the hospital. Due to early interview, the effects of their presence or absence during resuscitation cannot be estimated correctly. Furthermore, the sample size of this study was small. Pasqual et al. (18) showed that anxiety, satisfaction, and well-being were better in the group that witnessed the CPR operation rather than in the control group. The study of Campton et al. (19), on two groups of patient’s families ((FWR (family witness resuscitation) and non-FWR)), showed that PTSD, one month after the incident, was twice more in the CPR group than in the group that did not witness resuscitation; however, supportive intervention was not conducted for families in the CPR group. Similar results were obtained in another study done by Compton et al. (17). They divided 65 patient’s families into FWR and non-FWR groups and 30 and 60 days later examined both groups in terms of PTSD and depression. They found no significant difference between the 2 groups. However, in this study no supportive measure was provided for FWR group. However, Jaber et al. (16), in a study done on 570 family members, showed that PTSD and anxiety disorder were lower in the group that were supported by experienced staff during CPR in terms of mental problems than the group who received no emotional and psychological supports during resuscitation. This study also showed that PTSD, anxiety, and depression were significantly lower after 90 days in the group who had witnessed CPR than the group who did not. One year later, 408 family members of the same groups were examined in terms of PTSD, anxiety, depression, and grief disorders. Intervention and control groups had the same combination. Again, after a year, PTSD, depression, and grief disorders were significantly lower in the group who had received emotional and psychological supports. This study also showed that these disorders were significantly lower in family members who had the opportunity to be present at the bedside of their patient during resuscitation than those who were not present (15). In support of the above studies, a study was conducted on 133 patient’s family members in Iran, in the intervention (n = 74) and control (n = 59) groups; in the intervention group a nurse, who did not participate in resuscitation, was responsible in supporting the patient’s family psychologically based on the developed protocol. The findings showed that 100% of families tended to be present during resuscitation, and depression, anxiety, and PTSD were significantly higher in the control group (14). Nine descriptive cross-sectional studies were included in the meta-analysis. The desire of being present during resuscitation and coping amongst patients’ families were assessed. The pooled event rate of being present of 9 studies was 0.73 (95% CI: 0.60 - 0.83), which was statistically significant (P = 0.001) (Figure 2). There was an evidence of heterogeneity for combined effect size (I2 = 94.92%; P < 0.001, Q = 157.6). Only 6 out of 9 studies provided coping data, so the pooled event rate of coping of 6 studies was 0.62 (95% CI: 0.48 - 0.73), which was not statistically significant (Figure 3). There was an evidence of heterogeneity (I2 = 91.47%; P < 0.001, Q = 58.66). 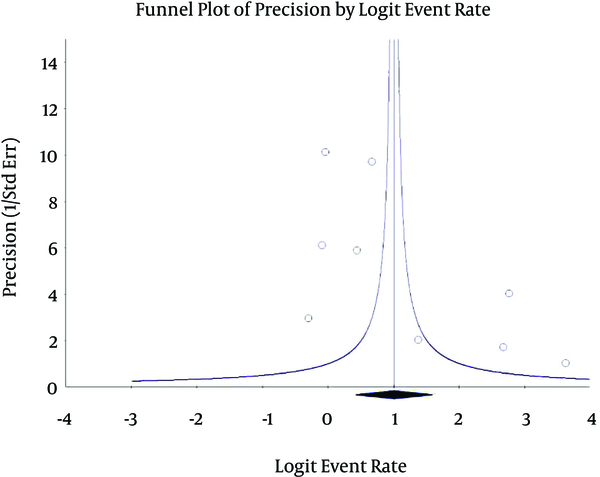 Publication bias was assessed by funnel plot (Figure 4). The papers examined from 3 perspectives of the presence of family, satisfaction, and coping showed that the patients’ families, in all studies, tend to be present during resuscitation of their beloved ones and also strongly believe that some rules should be passed that support the family’s presence during resuscitation and that they had the right to be present during resuscitation of their beloved ones. The results show that the difference between the rate of desire to be present during resuscitation and expected rate is statistically significant. In 2 studies, a group of families also believed that the physician should decide about their presence during resuscitation. In terms of satisfaction, the majority of studies show that almost all families were completely satisfied from their presence during resuscitation and acknowledged that their presence improved the patient’s outcome. Also, a sense of well-being and satisfaction can be observed in the families in papers investigated. However, the issue was assessed in a short time after resuscitation and the results will be somewhat different if these studies last longer. In terms of coping, when the patient’s families are studied after a few days or a few months, papers report controversial results. In studies conducted shortly after the patient’s death, no difference was seen between the effects of the family’s presence or absence during resuscitation. However, the positive effect of their presence has been shown in studies that were conducted after a reasonable time after bereavement. Nonetheless, these controversies can be related to the difference in the methods of studies, emotional and psychological supports during resuscitation, and the quality of interventions. When these studies were conducted with more intervals, the family’s presence and their emotional and psychological supports had a positive effect on them in terms of psychological conditions and anxiety disorders, depression, as well as PTSD. However, the role of the medical staff cannot be ignored in this regard. We would like to thank Dr. Sakineh Hajebrahimi, at the Iranian Evidence Based Medicine Center of Excellence, Tabriz University of Medical Sciences, Tabriz, Iran, for her valuable comments regarding the methodology design of our manuscript. This article is based on a dataset forming part of Asghar Jafari Rouhi’s specialty thesis, entitled “Psychological Effects on Patient's Relatives regarding their Presence during Resuscitation". It is registered at Tabriz University of Medical Sciences (No: 93.3–6.8) and was presented in June 2015. Authors’ Contribution: Hassan Soleimanpour, Saeid Safari, Asghar Jafari Rouhi, Fatemeh Sadeghi-Ghyassi, and Morteza Ghojazadeh, substantial contributions to conception and design, acquisition of data, or analysis and interpretation of data, drafting the article and revising it, critically for important intellectual content; and final approval of the version to be submitted; Jafar Sadegh Tabrizi, Maryam Soleimanpour, Amir Hossein Jafari Rouhi, and Arezoo Nejabatian, substantial contributions to conception and design, acquisition of data, or analysis and interpretation of data, drafting the article and revising it critically for important intellectual content; and final approval of the version to be submitted. Conflict of interest: The author(s) declare that they have no competing interest. 14. Soleimanpour H, Tabrizi JS, JafariRouhi A. Psychological effects on patient's relative regarding presence during resuscitation. [Unpublished].